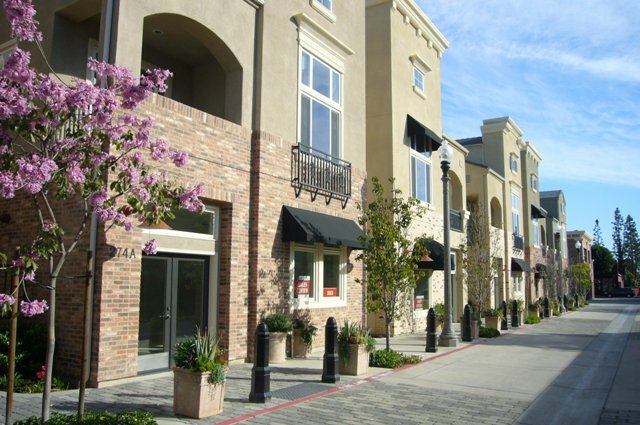 Prospect Village lofts for sale are a unique opportunity to own a mixed-use residential and commercial condo in the heart of Tustin. The twelve units built on the site of a historic building feature three stories—two floors for living, and one floor for running a shop or business. Prospect Village real estate is thus a great opportunity for professionals and entrepreneurs who want to own a gorgeous, modern loft that allows them to work from home. The lofts at Prospect Village offer an ideal living environment for professionals, thanks to their first-floor office space. Because they're zoned as mixed-use, these lofts allow you to operate a business out of your home, which is perfect for both professionals—like lawyers or architects—and entrepreneurs starting their own little shop. In addition to office space and a bathroom, the first floor units all offer a two-car garage, so you never have to worry about parking. The twelve units at Prospect Village are divided into to models, each with similar layouts but different sizes. The smaller, 2,300 square foot units offer plenty of living space on the second and third floors, with two bedrooms on the second and a master suite on the third. The second floor includes open-plan living room, dining room, and kitchen, as well as a small deck perfect for an evening cocktail or a barbecue, and the smaller bedroom can be easily converted into a den. Meanwhile, the larger, 3,000 square foot model offers significantly more space, especially in the third-floor master suite. Another advantage of the larger model is that it includes a back room on the first floor, ideal for a personal office separate from the main commercial-use area. Because this development is aimed at professionals and entrepreneurs, you can expect the finest building materials and top-of-the-line appliances. You'll also find that the exterior of the building has a unique charm, as the designers incorporated the most salvageable parts of the previous, historic building on this location. Finally, while you'll be located right in the heart of Tustin and close to lots of shopping and dining, you'll also be able to enjoy an upscale restaurant as part of Propect Village. So whether you're a professional looking to go out on your own, or a business owner who's looking for a place to live, work, and play, Prospect Village real estate is for you.